We visited Japan in January 2013 and enjoyed a fascinating 2 weeks. The holiday was textile based with lots of weaving, dyeing, silk painting etc. Sometimes we watched , sometimes we had a go. Great fun. The final 2 days were spent at the Tokyo Quilt Show admiring the beautiful, detailed work on display – and shopping! The most striking buildings that we saw were definitely the castles and temples. 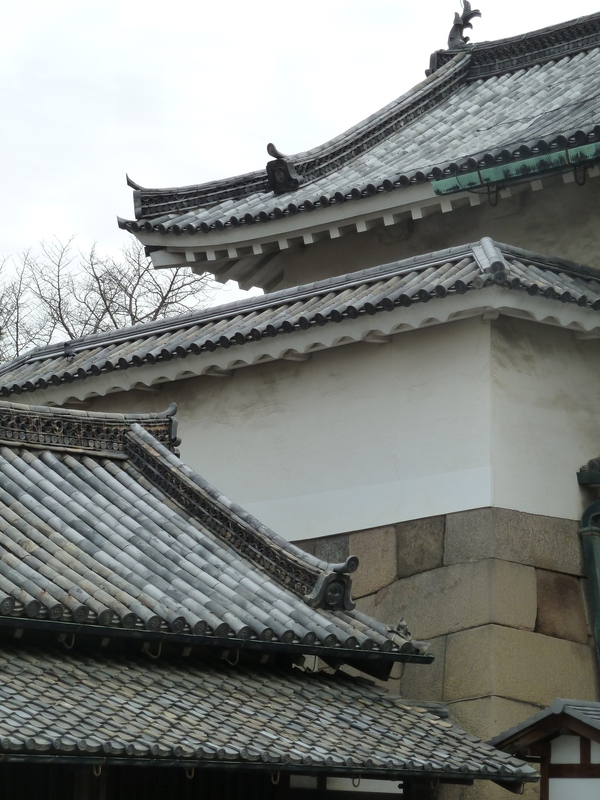 I found the roofs particularly interesting – lots of layers, curved tiles and some had rows of small end tiles along the bottom edges. My quilt design is developed from these roofs. I have included an aerial view of a pagoda showing 3 tiered, tiled roof levels. The blue circles are the end tiles. The flowers reflect the Japanese love of cherry blossom. The flower shapes and the quilted Fuji mountains are all hand stitched in a style similar to sashiko. 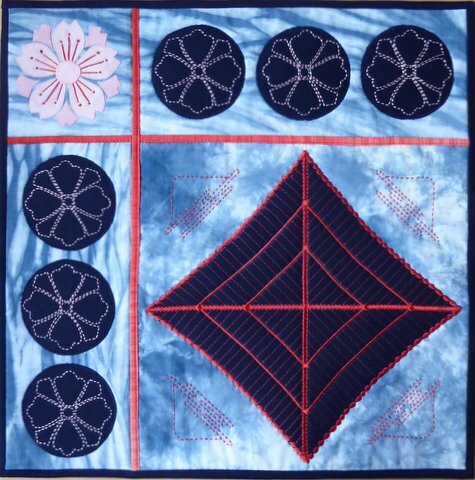 I have used all cotton fabric – the background was dyed by me at an indigo workshop, the dark blue was purchased in Tokyo. Hand embroidery is in cotton thread, machine embroidery is in viscose. I wonderful final piece. I love the use of the two different blue fabrics and the immaculate hand-stitching. Your work is so neat and exact with such attention to detail, a really great series, well done! This last piece fits perfectly in your series ! I like how with simple shapes you re-create an atmosphere. Beautiful. This piece is Japan at first sight. 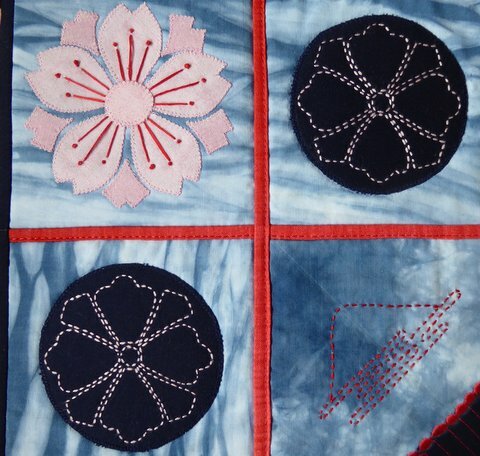 Especially the use of the colours and the sashiko quilting. Beautiful design and again so accurate! You created a great series. Quilting and travelling, a nice combination. I love the way you translated what you saw and thought would be interesting, in clear colors and forms. Your work shows great accurate and food for the eyes. And then the detail, Japanese fabric, used in a Japanese setup, beautiful last piece, to complete your series. I like your hand-dyed indigo background. It fits your quilt very well since indigo dye is an important traditional technique in Japan. And the sashiko-like stitching is beautiful. Well done. This last piece is a fitting end to the series—-and possibly the start to a new one featuring more places in your travels. The sashiko and hand stitching are beautiful. It must have been such a joy to “translate” your travels in this wonderful series. I admire how you were able with simple forms to create the feeling of a country. 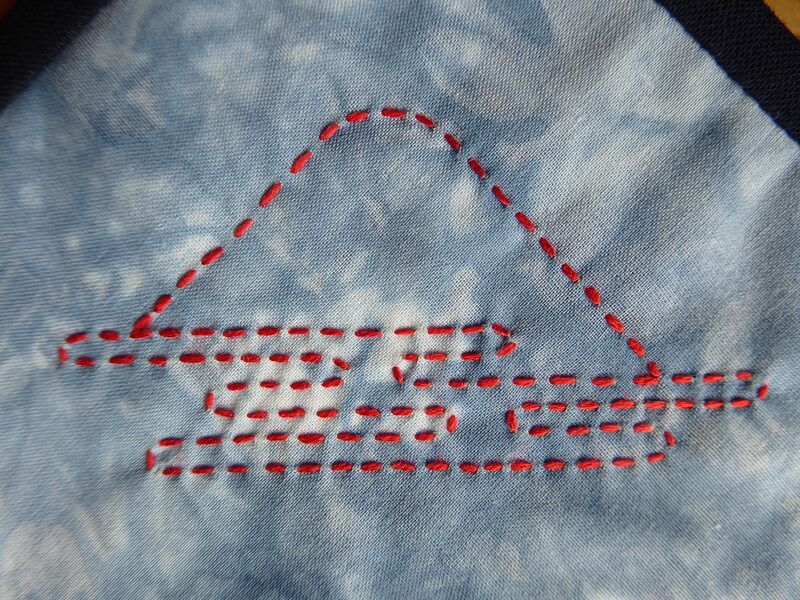 I love how blue en red are coming back in each piece and your handstitching is always so beautiful. A delightful end of your series. Another fabulously perfect quilt to end your series. How nice that you were able to include fabric you personally dyed in Japan and the beautiful sashiko, such wonderful memories you must have.